Fascinating, fast, and friendly but far too forgiving. Wait for the patches and iron man/lady mods. My ministers are looking at me like I've lost my mind. The country is an economic basket case, we're trailing in the polls, and my next policy decision is... tougher abortion laws. I pause for the gasps to subside, then, like a political Poirot, explain. Restricting abortions will mollify the religious component of the party membership in preparation for next turn's ban on teaching creationism. Returning Darwinism to its rightful place in the curriculum, together with a boost to science funding, will help address the 'technology backwater' situation that is doing so much damage to GDP. A healthy GDP together with some canny VAT and corporation tax changes, should, in the long run, equal prosperity and – pause to sip water and anticipate imminent applause – the voter support necessary for victory in the next election. 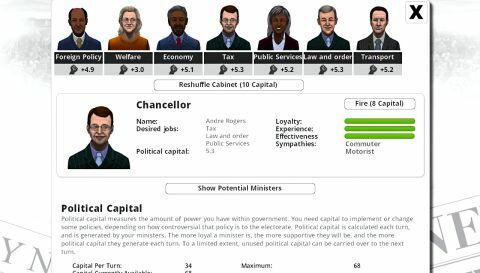 Welcome to the splendidly tangled world of government sim Democracy 3, a game where electorates are complex entities comprising over 21 overlapping social groups, and economies are vast cat's cradles of cause and effect. The web of intertwined factors would be overwhelming if it wasn't for one of the most ingenious interfaces in strategy gaming. Using an overview screen through which all policy impacts, voter motivations and national indicators can be surveyed simply by moving your cursor onto the appropriate icon, overseeing your nation – Canada, France, Germany, Australia, the UK or the US – is a doddle. Disappointingly, winning elections is also dead simple at present. Anyone prepared to put personal principles aside and play a popularity-chasing pragmatist is likely to experience Robert Mugabe levels of political longevity within their first day of play. Electorates feel much too tolerant, parties too malleable, and economic crises too easily weathered. In my current game I'm PMing Britain at high difficulty, and have swept to victory with more than 90% of the vote in two general elections. Once Positech have adjusted the challenge level (something they seem eager to do), hopefully they or the warmly welcomed mod community will turn their attention to national flavour. Without country-specific events, political systems and minister names, after a year or two it's all too easy to forget which ship of state you're captaining. Elections and oppositions feel similarly skeletal. For no apparent reason, the preelection promise mechanism from Democracy 2 has been abandoned, meaning national ballots now involve no interaction whatsoever. Lacking difficulty and definition at times, Democracy 3's secret weapons are its pace, topicality and moral mischievousness. Generating popularity often means Judas-kissing deeply held personal beliefs. Which reminds me... I've got fracking and death penalty bills to approve.